Home / Ask Pepe / Is the water safe to drink in Chile? Is the water safe to drink in Chile? Is the water safe to drink in Chile? The short answer is yes, the water is safe to drink in most places. Chile has a very high standard for drinking water and it is chlorinated in urban areas. Millions of Chileans drink the water every day and are fine. Of course, they have been drinking the water their entire lives. As a visitor to Chile, your body may take a few days to get used to the water. If you are concerned about the water, you can buy bottled water at supermarkets, kiosks, or corner stores. Look for agua mineral (mineral water), agua sin gas (non-carbonated water) or agua con gas (sparkling water). Give your body a few days to adjust and you should be fine with tap water. I found it very rare to be served plain water at someone’s house. Whenever we’d ask for water, they’d always bring out juice or Coca-Cola. There are some good powdered drink mixes (like Zuko or Sprim) available in stores that help any water you get taste that much better. I don’t know much about other states in the USA but when I move to GA the water was so gross I could not believe it! FL also had horrible tasting waster and most people had to have filters in both of these states. I was shocked at the horrible sulfuric taste! I missed the crystal clear sweet tasting waters of Chile’s tap water that tastes crispy. fresh, and sweet! 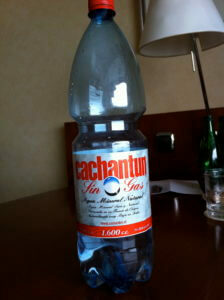 Chile’s water is amazing and many times drank mountains spring water from Chile and it taste it even sweeter! I love Chile’s clean, fresh, crispy, and naturally sweet water. What I heard is that they don’t put fluoride in the water like in the USA. This is better not for the teeth but for the toxins in the body since fluoride is toxic to the body. Now, I live in WA and the water is still gross but not as bad tasting as GA and FL. WA residents mostly have filters unless they have a well spring for sweet fresh water which some do! My point here is living in these two countries USA water is shockingly gross, nasty tasting, and much of the rural areas water have medication and contamination in the water! How I miss the safe tap crispy sweet water of Chile. Chile is a small amazing countries with so much awesome things to offer to its people. Thank you so much!!! Your answers are always wonderfully informative!!!!! Yes, in Chile the water is safe for drinking purposes.